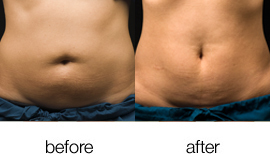 CoolSculpting by Zeltiq is a new, completely non-invasive way to gently and effectively reduce fat in targeted areas of the body, resulting in a noticeable, natural-looking fat reduction. What makes the CoolSculpting procedure different is that it uses advanced cooling technology called 'Cryolipolysis' to selectively target fat bulges and eliminate fat cells through a gradual process that does not harm the surrounding tissues. 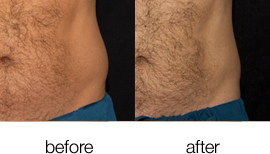 This procedure can significantly reduce stubborn unwanted abdominal fat, love handles (flanks) and back fat in one simple procedure and has recently obtained FDA approval in the US specifically for fat reduction. Unlike traditional invasive surgical procedures, the CoolSculpting by Zeltiqprocedure is completely non-invasive with no needles and no need for surgical incisions. Therefore, recovery time is not required; you may resume your normal activities on the same day as your procedure, including work and exercise. During the procedure, a non-invasive applicator is applied to the skin surface to deliver precisely controlled cooling to target and eliminate fat cells in specific areas of the body. As they are exposed to cooling, the fat cells begin a process of natural fat cell removal. The fat cells in the treated area are gradually eliminated through the body's normal metabolic processes. The process is similar to how fat from food is eliminated, resulting in a reduction in fat bulges (average of 20%) that is visible in patients in about two to three months after the procedure. What's more, as long as the patient maintains his or her weight with diet and exercise, long-term results should remain stable. A consultation is needed prior to your CoolSculpting by Zeltiq� procedure to assess suitability and discuss your requirements.